Looking for beautiful, well made clothes that won't break your budget? Check out DownEast Basics, a site that keeps fashion fabulous and affordable! I love DownEast Basics because their clothes are fun and girly without being too over the top. They are also up on all the current styles: ruffles and the color of the season - purple! Down East Basics recently sent me two of their new items to review: The Dancer Top in white is classic and goes with everything. I was able to wear this top with dress pants to work, and then with jeans when I went out with the girls for margaritas! It literally can and will take you from day to night with just a few changes. 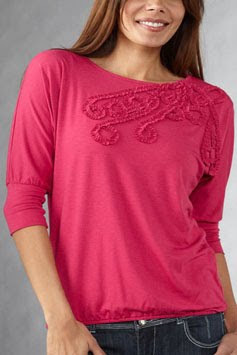 :) I love this top because it is soft, very comfortable and of course, very versatile. It had the feeling of a favorite t-shirt, but still looked dressed up. I especially loved the way the sleeves were slightly looser in the top and more fitted at the bottom. It was a pretty detail that really added to the top. And of course the ruffle detail on the top is delicate without being too much. DownEast also sent me their very hot Vertical Zipper and Buckle Bag. It's awesome! It's big enough that I can fit everything I need for the day but not so big that I lose everything. It has lots of great compartments so I can keep all my small things (lipgloss, gum etc) together. But the best part is that the whole large compartment is zippered - something that is for me, totally essential, and surprisingly, (in my opinion) not enough bags have today! DownEast has a ton of gorgeous accessories and not just great bags! They have a whole line of rhinestone rings, necklaces, earrings, bracelets and belts! DownEast currently has a sale on their gorgeous dresses: all dresses are $25 or less! *Tell me your favorite product from Down East Basics! You have until Friday, February 5 @ 7pm EST to enter! (Winner must respond within 48 hours.) Giveaway open to U.S. residents only. I also entered your cover your hair giveaway! I'm a fan of Down East on Facebook! Frosted Flowers Cardigan! The pink is such a fun color. I love the first lady skirt..you can email me via blog.. Such a tough decision! I believe my favorite item would be the Double Take Jeans. I love the wrapped up top in black! I love the versatility of their layering basics. It allows me to wear more outfits! I like the frosted flowers cardigan. I am a Downeast Basics FB fan. Entered the Cover your hair giveaway. i have been a downeast fan for many years and have always loved their layering tees the most but my current favorite is the short story sweater. Ooooh ... I love the frosted flowers cardigan. So pretty and feminine! I like the Rock Star Jean. I like the full bloom top. I like the Double Take Jeans. I entered your cover your hair giveaway! i love the he loves me dress...that's coming soon! I love the Butterfly Kiss dress! I'm a fan of your's on FB! I'm a fan of Down East on FB! I love the Cat Walk Jeans! 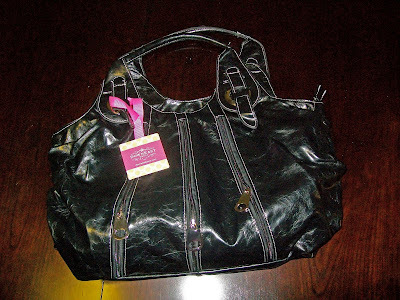 I LOVE the black handbag you pictured, but could not find it on the site. I do like the Oceanfront Dress. It looks so comfy! I love the frosted flowers cartigan - so cute! I love the Rock Star Jean! I entered the eShakti giveaway! I love the polka dot tote. It's really cute. I like the pink dress you have pictured! I love the Oceanfront Dress in Chocolate!